Euphonium + Percussion is a cutting edge chamber ensemble, a duo of Brian Meixner and virtuoso percussionist/composer Nathan Daughtrey. 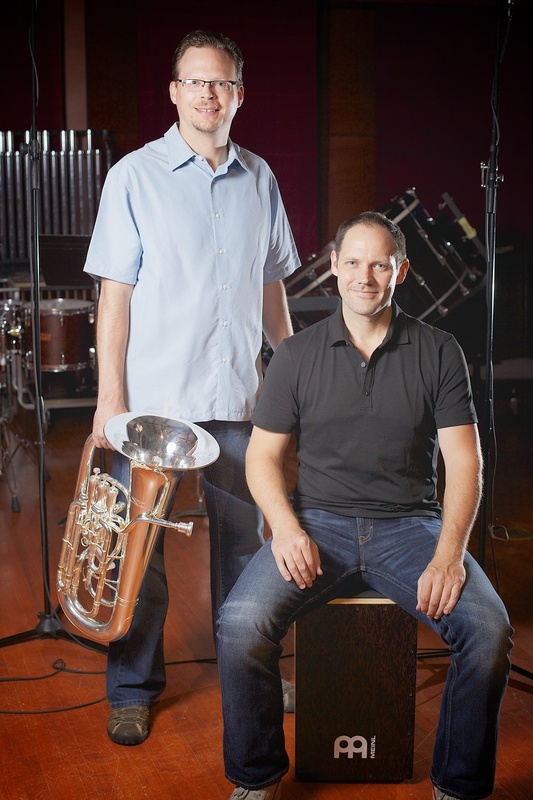 Euphonium + Percussion is a cutting edge duo with Brian Meixner and virtuoso percussionist/composer Nathan Daughtrey. The two collaborated on the recent album "Praxis", featuring the duo as well as several pieces for euphonium with percussion quintet. Two of Nathan's award-winning compositions are included on the recording. Listen HERE for sounds samples from this album! The duo has been featured in recital at several music conferences/festivals and as guest artists/clinicians at numerous universities. Brian and Nathan provide a unique combination of talents and experiences that entertain audiences as well as educate and inspire music students of all ages. Contact Brian for availability and booking information.